Scientists are zeroing in on the seagrass meadows that could help slow down climate change. Seagrass meadows are great absorbers of carbon dioxide from the air. But the algae, animals, corals and plants that live among them release large amounts of carbon dioxide, according to newly released research. The scientists are now identifying seagrass locations with fewer emitters to target for conservation. Scientists at Florida International University examined seagrass meadows in Florida Bay, some of the largest on Earth, where waters are warm and plant and animal abundance is high. They compared these ecosystems to those in southeastern Brazil where meadows are smaller, waters are cooler, and plant and animal abundance is lower. They found that although Florida Bay’s seagrasses act as carbon sinks, the organisms living among them offset the benefits of seagrass carbon storage by releasing carbon dioxide. FIU researchers take samples of deep sediments in Florida Bay. The world’s seagrasses are disappearing at alarming rates because of grazing, overfishing, pollution and poor management. The findings could aid decision-makers in identifying seagrass meadows with greatest overall carbon dioxide storage potential, so they can target conservation efforts and maximize sequestration. Scientists studying seagrasses have traditionally focused on the role of organic carbon in the carbon storage cycle. As seagrasses turn sunlight into energy, they take in carbon dioxide to make plant tissue. When they die, the tissue decomposes and organic carbon accumulates in the soil. This organic material is the basis of carbon storage inventories and mitigation plans. At the same time, the organisms living in seagrass beds build their skeletons and shells with calcium carbonate, which is made up of inorganic carbon. When the inorganic carbon is considered in carbon storage inventories and mitigation plans, the seagrass ecosystems of Brazil store more carbon dioxide than those in Florida Bay. Fourqurean has dedicated his career to seagrasses. His research provided the first global analysis of carbon stored in seagrasses. He has presented worldwide and testified before the European Union championing for Blue Carbon, a global initiative that allows regulated sources to buy credits for greenhouse emissions, and help restore and preserve seagrasses for mitigation. The money is used to preserve the world’s seagrasses, mangroves, marshes and other resources that naturally store carbon. Most seagrass research is done in areas with big seagrass meadows, including south Florida, the Mediterranean and southeast Asia. South America has been overlooked because of its lack of seagrass coverage and species diversity. 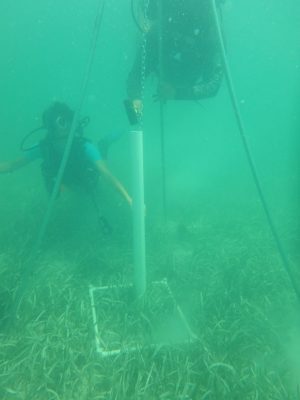 Since the ability of seagrasses to store carbon varies from place to place, the researchers call for more thorough studies on the relationship between seagrasses, the local environment and the carbon cycle. FIU’s Marine Education Research Initiative is housed in the Institute of Water and Environment. FIU launched the institute in 2016 to address global water and environmental issues. It brings together some of FIU’s top centers and programs to expand research and community engagement in the face of growing environmental threats, including the Center for Aquatic Chemistry and Ecotoxicology, Sea Level Solutions Center and Southeast Environmental Research Center, as well as Everglades programs and international water programs. The study was recently published in Limnology and Oceanography. It was done in collaboration with the State University of Rio de Janeiro in Brazil. The study was funded by the Foundation for Support of Research in the State of Rio de Janeiro, FIU’s Latin American and Caribbean Center, and the Florida Coastal Everglades Long Term Ecological Research (FCE LTER) Program. Housed at FIU, the FCE LTER Program brings together researchers from nearly 30 institutions to study how water, climate change and people impact the Florida Everglades.